When I first started as a safety, health, environment and quality (HSEQ) advisor, I found myself shocked that my performance targets included outcome measures like LTIFR, MTIFR and energy consumption. Rather immaturely, my argument was that this was unfair since I had no control over those results – they were measures for the line managers who controlled the workplace, the work tasks and the workforce. As an HSEQ advisor, my role was to advise – use my skills, knowledge and expertise in risk management, legal compliance, management systems, auditing and a raft of other things to assist those line managers with control to achieve better HSEQ outcomes. So I saw my role as accountable for the means, not the results. Stephen Covey is best known for his book “The 7 Habits of Highly Successful People: Powerful Lessons in Personal Change“. Covey introduces the concept of circle of concern and circle of influence. In short, effective people focus their energy in the circle of influence – on the things that are changeable, even if you don’t control them directly. Influence (and control) can grow as a result. Covey describes these people as proactive people. 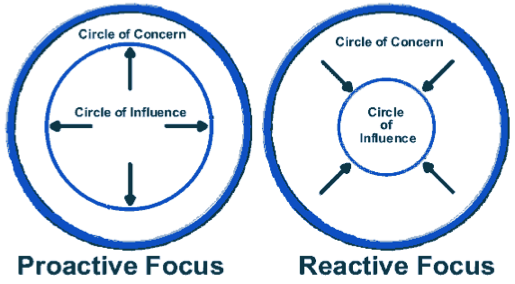 Reactive people on the other hand spend lots of energy in the circle of concern, on things they neither control nor influence. You can be really busy in that space, going nowhere fast. Sometimes HSEQ professionals can unwittingly find themselves confined to the circle of concern. Not because they are unintelligent, but because they lose sight of the results. It’s an easy trap to fall into. HSEQ people are generally systems-focussed. This encourages religious-like faith in a system as THE means to the ends, often becoming an end in itself. Procurement policies, certification requirements, internal and external auditing can all drive this. The size of the challenge should not be underestimated and many readers may have heard comments such as “But it’s the culture of the company”. “It’s the senior managers who don’t listen”. “It’s the industry we’re in”. “It’s a lack of resources”. “But it’s the economy”. These kinds of statements, these excuses, originate in the circle of concern. They are symptoms of a lack of influence and indicate that more effort or creative thinking is needed to expand that influence. I realised more effort and influence was required when I accepted that I shared the same targets as my line management customers. To borrow Warren Buffet’s phrase for this context, I had skin in the game – but little, if any, control. My best option was to focus all my energy in the circle of influence, to build relationships, to communicate effectively, to demonstrate the value of the means – in the hope that the means achieved the desired results. And they did. I now go to work every day to help businesses protect people, to operate sustainably within their environment and to keep customers satisfied – results. I have skin in the game. 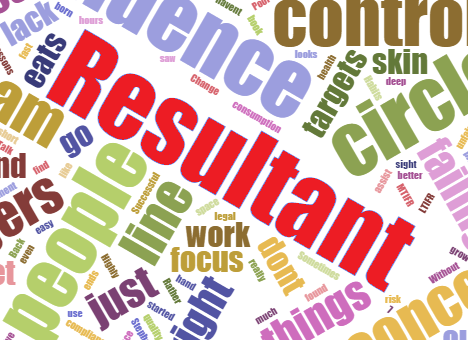 I am not a consultant, I am a resultant. We all should be.